As Anne Shirley has said, "I'm so glad I live in a world where there are Octobers." While every October holds its own special charm, this one is all the more precious because it holds something I've been looking forward to for ages: Return to Green Gables. Alexa from Alexa Loves Books, Rachel from Hello, Chelly and I wanted to celebrate this kindred spirit, so we've got some fun things in store for you! Be sure to visit all of our blogs during the next week as we pay tribute to the Anne of Green Gables series by L.M. Montgomery. For today, we're all giving an Anne-ish twist to features on our blogs! 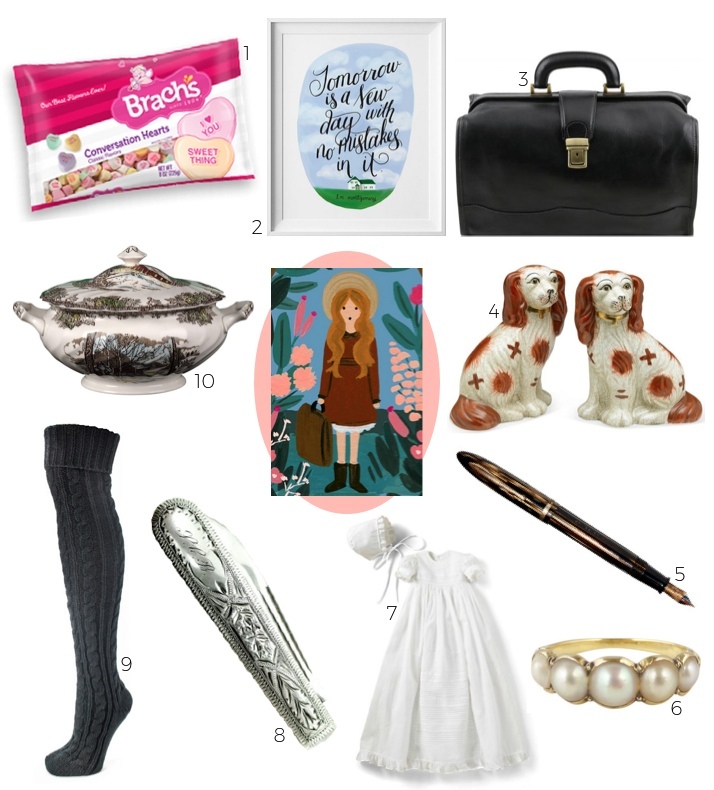 I'm highlighting the Anne series for Buy the Book, a monthly feature where I share a gift guide inspired by something I've read. It's a little play on "by the book" since all of the gifts come directly from quotes or scenes in the book featured and, you know, since it's all stuff you can buy. I'm including a snippet from the book for each item so you'll know why I picked it! 1. Brach's Conversation Hearts ($15.76) - There are so many items you could pick for Anne of Green Gables, but I decided to go with a "hidden gem" moment. It's not the most memorable scene from the series, but I've always loved Gilbert trying to win Anne's affection (or at least her forgiveness) with a candy heart. "Marilla, isn't it nice to think that tomorrow is a new day with no mistakes in it yet?" "I'll warrant you'll make plenty in it," said Marilla. "I never saw your beat for making mistakes, Anne." 2. Tomorrow is a New Day Anne of Green Gables Print ($16) - Rather than highlight an item specifically mentioned in the first book, I wanted to feature a print of one of my favorite quotes. I love Anne's outlook on life because she's just so optimistic! She gets into a lot of scrapes, but she always learns from her mistakes. 3. Tuscany Leather Raffaello Doctor's Bag ($269.65) - It took some time to decide what I wanted to choose from Anne of Avonlea before I settled on a doctor's bag. I love when Anne and Gilbert talk about the future - and that they're both ambitious at school. Gilbert's profession is a big decision, so this seemed like the perfect pick. "We shall be away for two years, perhaps three. We sail in June and we shall send you the key, and leave all in order for you to take possession when you choose. We shall pack away a few things we prize especially, but all the rest will be left." "Will you leave the china dogs?" asked Anne timidly. "Would you like me to?" 4. Pair of Staffordshire-Style Dogs ($35) - If you've read Anne of the Island, you know that the china dogs at Patty's Place are beloved members of the household. I loved they had names (Gog and Magog), and they are mentioned again in the series when Anne receives them as a very special wedding gift! 5. Vintage Golden Brown Sheaffer Feather Touch Fountain Pen ($45) - My biggest complaint about Anne of Windy Poplars? Anne's letters to Gilbert are edited, and we don't get to read any of the romantic stuff! Either way, I loved the idea that she could only write that kind of letter if she had the right kind of pen. "I've never really liked diamonds since I found out they weren't the lovely purple I had dreamed. They will always suggest my old disappointment." "But pearls are for tears, the old legend says," Gilbert had objected. 6. Victorian Antique Pearl Engagement Ring ($312.21) - It's established in the very first book that Anne is quite disappointed by diamonds, and I love that the sentiment appears again in Anne's House of Dreams. But I particularly adore Anne's comments accepting the sorrow of life with its joy since both occur in their marriage. 7. Infant's Two-Piece Christening Gown & Bonnet Set ($225) - I decided to include another item from Anne's House of Dreams because the birth of Anne and Gilbert's first child marks a huge turning point in the series and in their marriage. They go on to have six more children throughout the series, so it's always a full house! 8. Antique Gorham Sterling Silver Pocket Knife ($125) - Since Anne of Ingleside is the last book where you really spend time with Anne and Gilbert together, I decided to pick an item representing their fifteenth anniversary. There is some miscommunication and misunderstanding that day, which seems pretty realistic to me. "Why didn't you put on your shoes and stockings?" asked Una. "Hain't none to put on. All I had was wore out by the time winter was over," said Lida indifferently. For a moment Faith stated in horror. This was terrible. Here was a little girl, almost a neighbour, half frozen because she had no shoes or stockings in this cruel spring weather. Impulsive Faith thought of nothing but the dreadfulness of it. In a moment she was pulling off her own shoes and stockings. 9. Muk Luks Women's Black Cable Knit Over the Knee Socks ($17.99) - This might seem like a random scene from Rainbow Valley, but I thought it captured the spirit of the book. You see the kindness of the Meredith children, but it's also a moment that backfires and brings them under scrutiny. But I won't tell you why! Rilla got the clothes–the cheap, sleazy garments the poor mother had made ready as best she could. But this did not solve the pressing problem of the baby's transportation. Rilla looked helplessly round. Oh, for mother–or Susan! Her eyes fell on an enormous blue soup tureen at the back of the dresser. 10. Johnson Brothers Friendly Village Soup Tureen ($57) - I'm not sure if this soup tureen is large enough to hold a baby, but it was so pretty that I had to use it to represent this pick! When Rilla brings home a baby in Rilla of Ingleside, it's the catalyst for a big change in her character. I loved this part of the book! Check out Rachel's Book Bags and Alexa's Bookish Style Files! And come back tomorrow for three Anne-inspired discussion posts. I really like all these goodies, H! The socks and the ring are probably my favorite items you've chosen, and I'm seriously contemplating buy them both for myself.